Summer is here, the weather is warming and it's time to think of some beach gift ideas for him. This extra large bodyboard looks great for the bigger guy (or gal) who enjoys getting out for some bodyboarding and cooling off in the ocean while participating in this fun water sport. 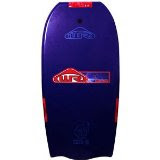 Wave Rebel 45" XXXL with Bat Tail @ Amazon.com .